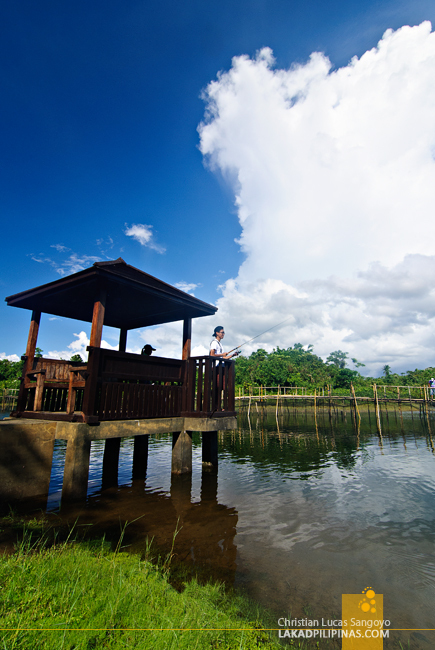 From a wooden bridge, I saw ten huts fronting a part of Laguna’s Lake Caliraya. The sun was baking us alive, so with brisk strides, we quickly crossed the bridge and headed for the nearest shed. This is gonna be your home for the night, a guide from Mountain Lake Resort cheerfully told us. Right outside the huts, I can see some obstacle courses I usually associate with military trainings. Oh no. I totally did not sign up for this. 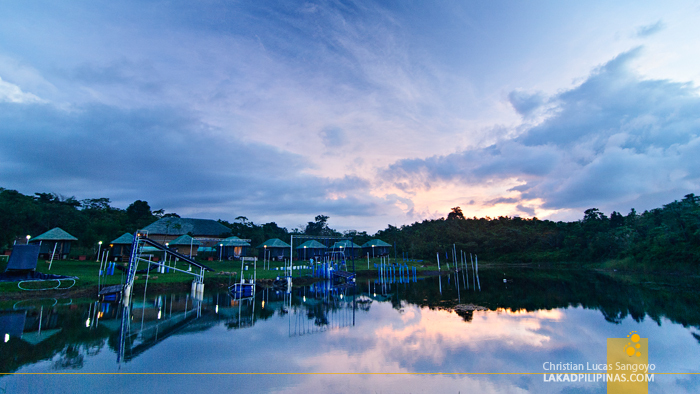 Some weeks back, I received an invite from Caliraya Spring’s Mountain Lake Resort. I asked some friends to join and was able to gather nine bloggers. From Cubao, we boarded a bus (Php150.00) bound for the town of Sta. Cruz in Laguna. Another tricycle ride later (Php250.00) and we were at the gate’s resort waiting for their van to pick us up. 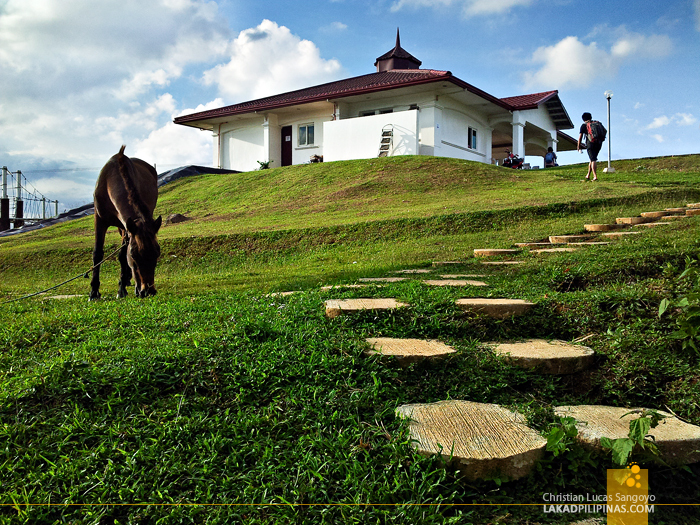 Our group was first herded to the Caliraya Springs’ club house. I was a bit puzzled, I thought we were gonna be staying at a resort near the lake. I don’t see any substantial body of water from where we were. Looking out from the elevated dining hall of the club house, the only thing I can see was an endless carpet of greens from a golf course. 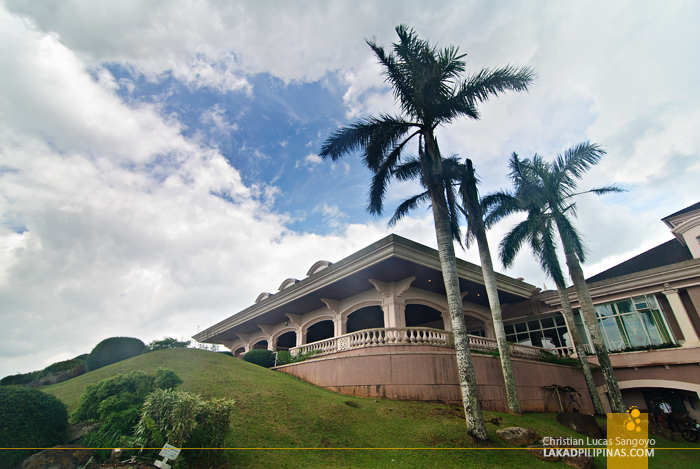 It was soon explained to us that Caliraya Springs is indeed a golf course; a world-class nine-hole and eighteen-hole affair designed by golf legend Arnold Palmer. That was all well and good, but we were no golfers. What I have on my mind is to swim on the lake. Patience, our guide told us, we’ll get there, we’ll get there. First, let’s have some lunch. I definitely wouldn’t say no to that. While it was really nice to have our lunch al fresco, there were just too many flies that day so we decided to hold it instead in their Banahaw room. And for the next 48 hours, this was where we fattened up. La Cucina De Caliraya Restaurant’s offerings were all quite superb. From lunch, dinner, breakfast and everything else in between, they never failed to wow us with their dishes. Their kitchen is headed by head chef Noryl Aril, we were simply so enamored by his cooking that we requested to see him and thank him personally. While everything was really good, there were a few dishes that really stood out for me. 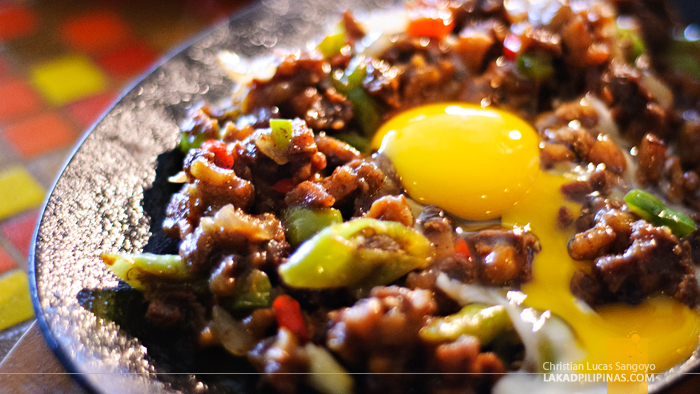 Their sizzling pork sisig was one of the best I’ve tried in a long time. 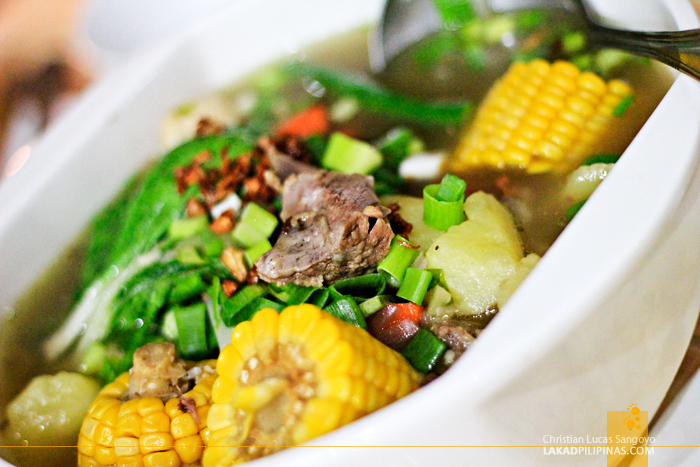 Their beef bulalo differentiates itself from the usual ones by being filled with veggies and corn. 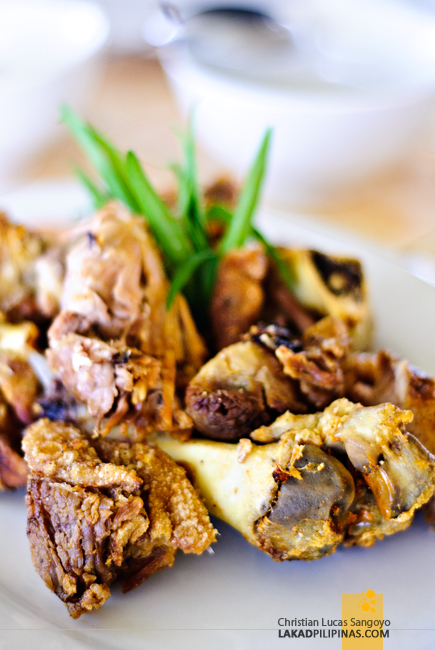 And their crispy pata; well, a crispy pata is a crispy pata, you can never really go wrong with it. Soon after, we finally headed for the Mountain Lake Resort. It was still a ride away from the club house, but not to worry, a resort van is available to bring guests back and forth. 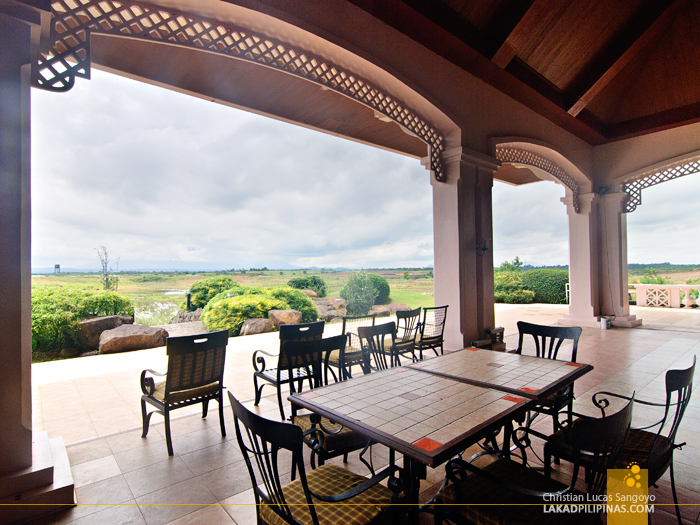 The resort is located near a brook that branches out from Lake Caliraya. 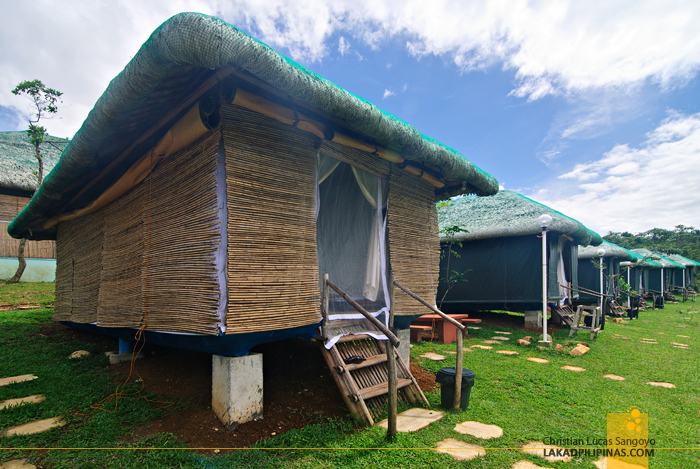 The walls of the huts are constructed of bamboo and the roof made from thatch. There’s no air-conditioning, but its interior is cool enough; even without the use of the ceiling fans. A single hut can house up to ten individuals. The toilet and bath are located separately at the back of the huts. 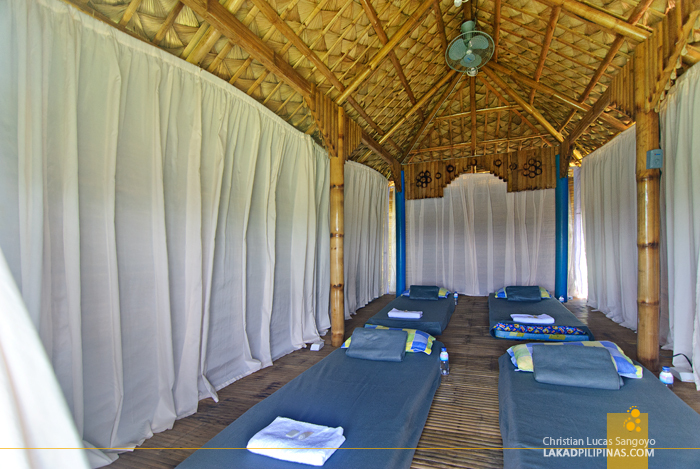 Since the resort expects big groups, it houses numerous stalls of water closet and shower rooms. And unlike most CRs of this kind, the one at Mountain Lake Resort is not only super clean but also well equipped, it even has bidet. There are numerous fun activities that can be done at the Mountain Lake Resort and we got to try a few of them. 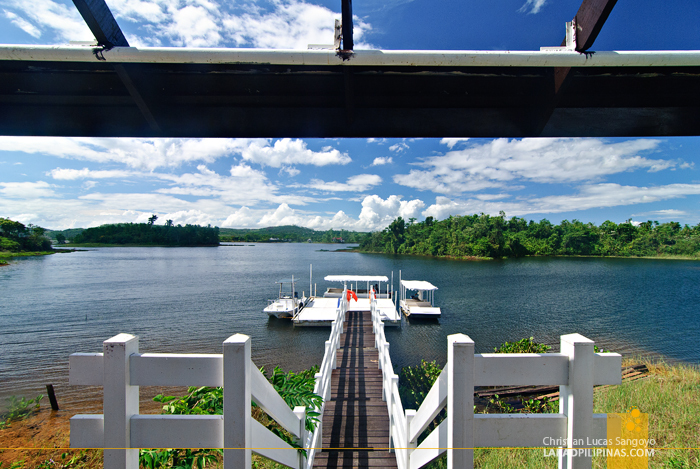 The first one we did was to sail around the man-made Caliraya Lake. The water was very serene and the view, very pastoral. We initially planned on jumping down the water but the boat we rode in was quite high and getting back was a bit of a problem, especially for someone like me who’s really not that fit. We also tried fishing at the resort’s massive fishpond. They showed us how to hook pellet baits and swing the rods for maximum affectivity. Although, no matter how hard we threw and how long we waited for the dories to bite, they simply ignored our offerings. Our guide said it was better to fish in the morning than in the afternoon. Oh well. 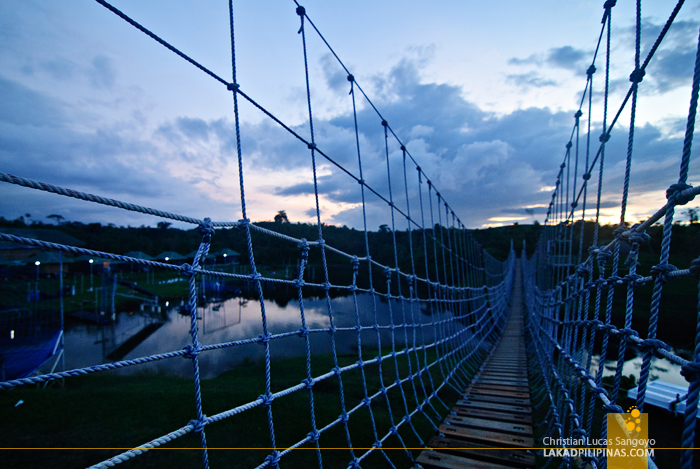 Mountain Lake Resort also has a mini-zip line that crosses over a small portion of the lake. 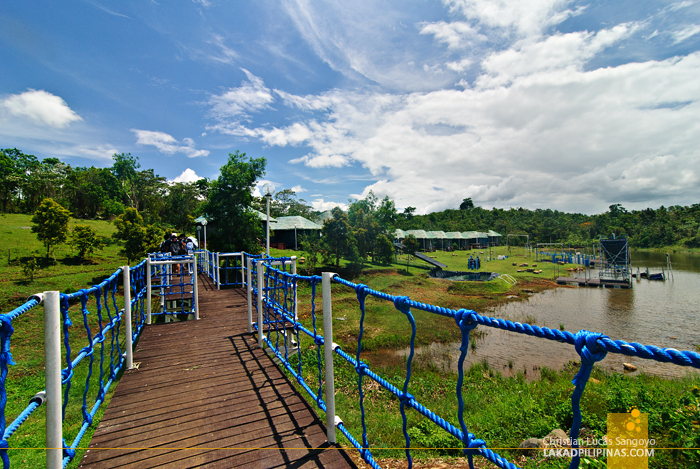 Once you reached the end, you go back via the hanging bridge parallel to the zip line. 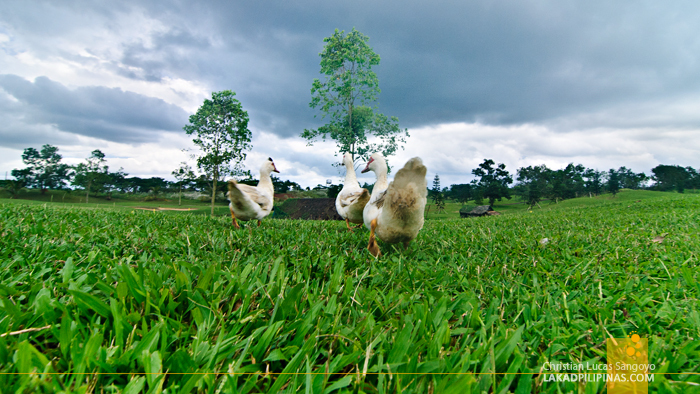 Back at the Caliraya Springs club house, we went to a small pond where a group of ducks were wading. Armed with a bucket of pellets, we were told to feed the ducks. I thought it was gonna be a bit corny, but once the ducks started trailing us, it was surprisingly fun, they were just too cute! 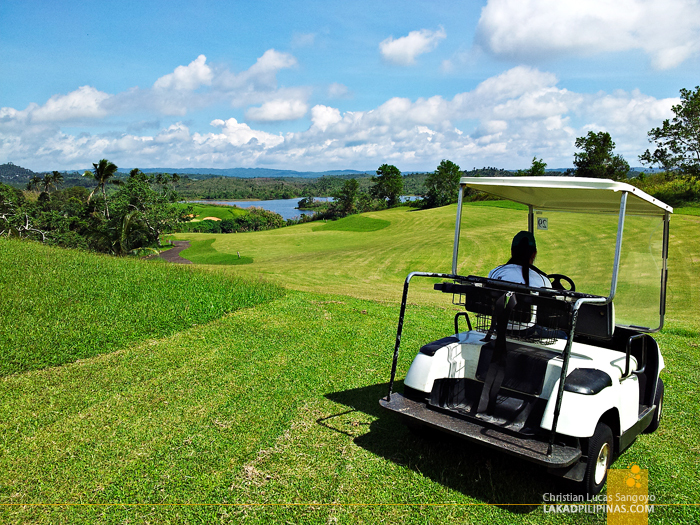 One of the nicest things we did at Caliraya Springs was to try golfing at their driving range. It was my first time to hold a golf club and thought it was gonna be easy as a pie. Well, I have another think coming, it was harder than expected. Actually, it was really, really hard. But the highlight of our stay at the Mountain Lake Resort was going through their obstacle course. They have a basic and an advance one; our group took the latter which is done over water. The course comprises of the Slide & Drop, the Cobweb, the Wall Climb Slide, the Tire Challenge, the Cable Balance, the Karate Kid, the Military Crawl (which is done by swimming under the water), the Tarzan Swing, the Log Crossing and lastly, the Palosebo. 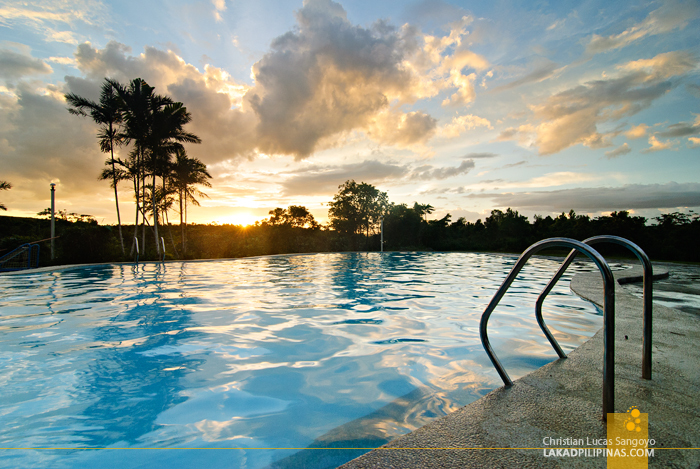 The resort also has a small swimming pool where we usually hang out after all the activities. It wasn’t as deep as I prefer but the water is warm, which is really nice. Hours were spent here, sharing endless stories and gossips, and laughing our asses off. 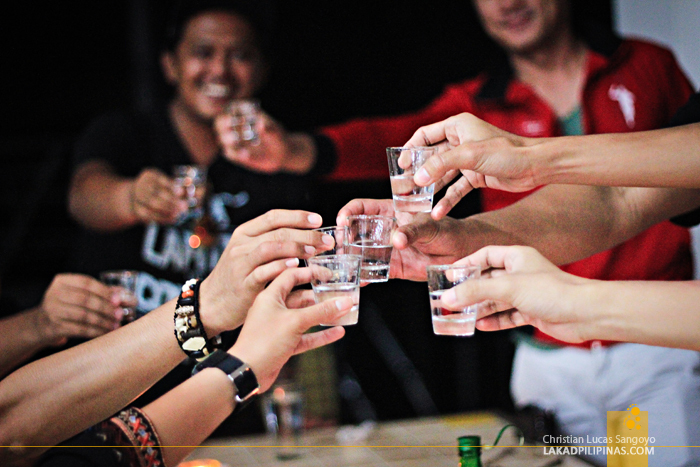 Without question, our night was spent with spirits. Not ghost hunting, but alcohol. Mountain Lake Resort was so thoughtful that they even lit a bonfire for us at a nearby knoll. Another round of never-ending stories, gossips and laughter ensued. After the fire died, we transferred to the Marina. It was videoke time. There are SanMig Light and Pale Pilsen beers available at the resort, but unfortunately, no Red Horse. They were, however, kind enough to buy us a case of our preferred drink provided that we pay for the required corkage fee (Php200.00 per case). 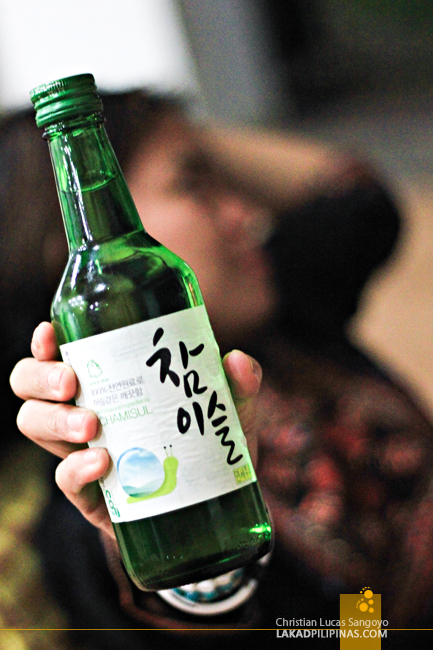 And after downing everything, we resorted to drinking Korean Soju which they said is quite popular with their guests. To say that we had so much fun on the two days we stayed at the resort is an understatement. 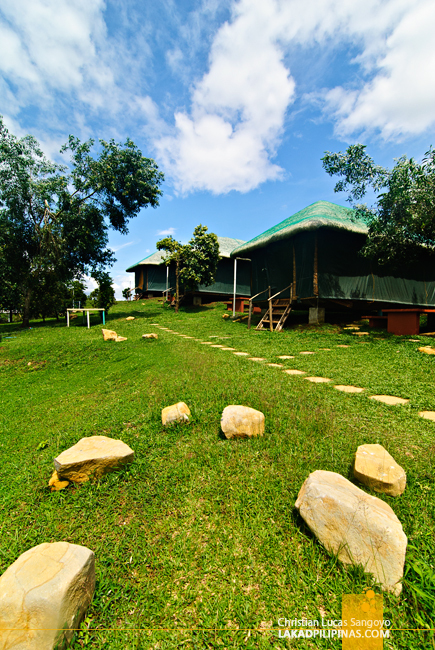 Adventure, relaxation, amazing scenery, good food and superb friends; it was a weekend well-spent at Caliraya Spring’s Mountain Lake Resort. Especially the food! Balik tayo! 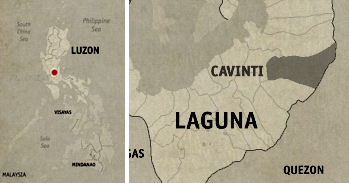 How to get there po? Sta cruz bus tapos saan bababa? Are we allowed to bring our own food? how to get there po from pampanga?